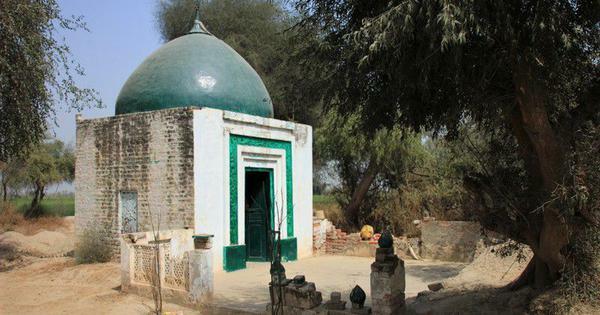 I saw another similar situation at the shrine of Shah Hussain, the 16th century mystic poet, who is believed to have fallen in love with the Hindu boy, Madhu Lal. They are buried in Lahore together, in a union that signifies the Oneness of the world – Monism. 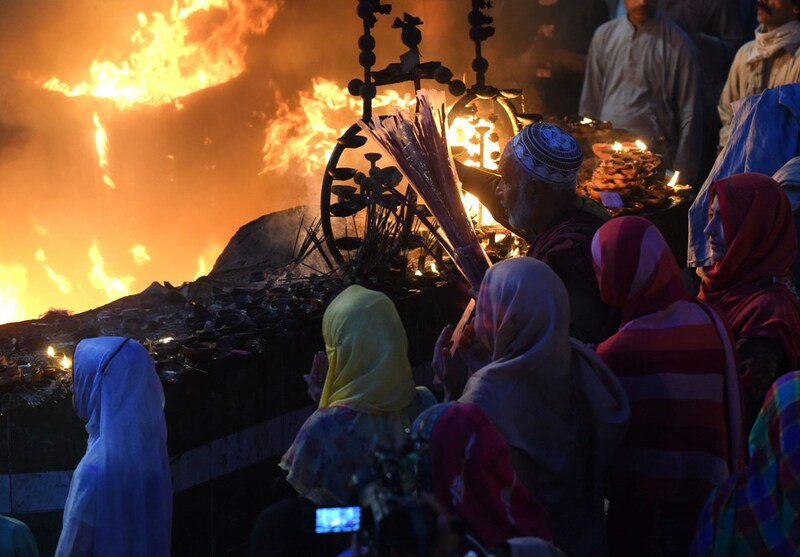 There is a fire just outside the shrine to Madho Lal Hussain in Lahore, which is lit throughout the year by the lamps of his devotees. Much like the fire at the Naghyana shrine, this one too was simmering when I visited a few months ago. 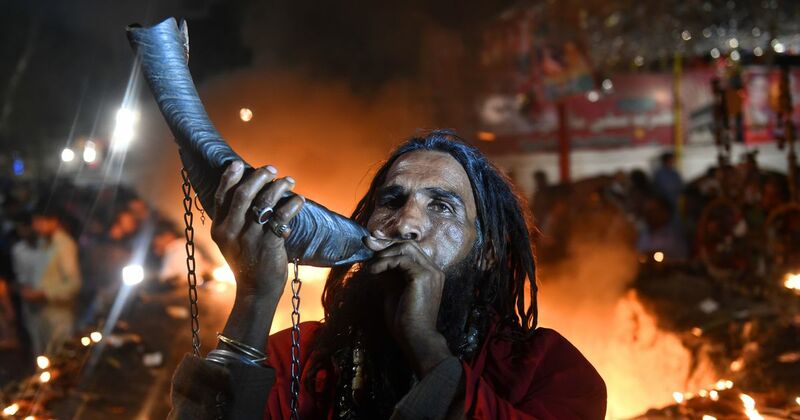 The situation at the shrine this past week, however, was different as thousands of devotees of the saint converged there to celebrate his urs, also known as Mela Chiraghan or the festival of lamps, one of the greatest festivals of the city of Lahore. The fire must have been alive, thriving, whirling and swinging, imitating the dhamaal or hectic activity of the dervishes around it. Devotees gather at the shrine of Madho Lal Hussain during the three-day-long Mela Chiraghan festival in Lahore on March 24, 2018. (Photo credit: Arif Ali/AFP). Fire has long been held sacred in the indigenous religious traditions of South Asia. The Zoroastrians are popularly and falsely referred to as fire worshippers. Their religious shrines are known as fire temples with fire forming a central feature in their religious rituals. At a fire temple the fire never dies. The original fire (other traditions assert it was ash from the fire) that was brought from Persia by the fleeing Zoroastrians was set up in a temple off the coast of Mumbai, the oldest fire temple in the world. There is a deeper connection between the Zoroastrians and the Sufi ascetic tradition of South Asia. The term dervish, popularly used to describe ascetic Sufis, is derived from the Persian word “daryosh”, which is derived from the word “drigu”, for devotees of Zarathustra. While there is an etymological connection between the drigu and dervish, there also seems to be a religious continuity between the two, with fire joining the knot of these two traditions. For many dervishes, it is not just fire, the ash from the fire of a Sufi saint is also significant. Just like the Shaivite sadhus, they believe ash from this sacred fire has magical properties and use it frequently for healing purposes. It is around these fires that different dervishes gather and engage in hashish consumption, another connection that binds them with the Shaivite sadhus. In both of these traditions, the consumption of hashish or other forms of cannabis enjoys religious approval. Sometimes Sufi ascetics perform dhikr around the fire – this involves the invocation of God in a liturgical manner, using a breathing technique in a particular rhythm. Jurgen Wasim Frembgen, a German anthropologist who has worked extensively on the Sufi culture of Islam, finds the origin of this form of dhikr – a particular feature of South Asian Sufism – in the yogic tradition. While fire is important in their religious asceticism, so is the tong or chimta, which is used to maintain the fire. The chimta is an essential possession of a Sufi dervish. It is used to announce the arrival of a dervish into a village. It is used by him for rhythm when he sings Sufi songs. Often, it was the only instrument a Sufi dervish possessed. The chimta is also kept by sadhus who not only use it to maintain fire but as a percussion instrument when need be. It is also part of the Sikh tradition where it is used as an instrument to perform religious music, following a trajectory that has its origin in the Shaivite Sadhu tradition and their fire-tending necessities. Scratching beneath the surface, one would find similar traditions of fire veneration in Buddhist and Jain traditions. Moving beyond the demarcations that divide these religions, it becomes impossible to maintain these boundaries in the ascetic realm. Where does the Shaivite Sadhu tradition end and Sufi dervish tradition begin? How does one begin to differentiate between the dervish and the Udasi devotees of Shri Chand? While there are several traditions that join together the threads of these indigenous religious practices, one of those traditions is their communal devotion towards fire, perhaps a tradition all of them borrow from Zoroastrianism.